Last week saw the capital play host to London Design Festival. All sorts of beautiful creations sprung up all over the city, including a big metal alphabet in Liverpool St, a lion spouting poetry in Trafalgar Square and our favourite; Multi-Ply, a 3 storey plywood building in the Sackler Courtyard. Multi-Ply has obvious appeal in that it is a particularly beautiful version of the increasingly popular pre-fabricated, modular structure that looks set to be a big part of our architectural future. 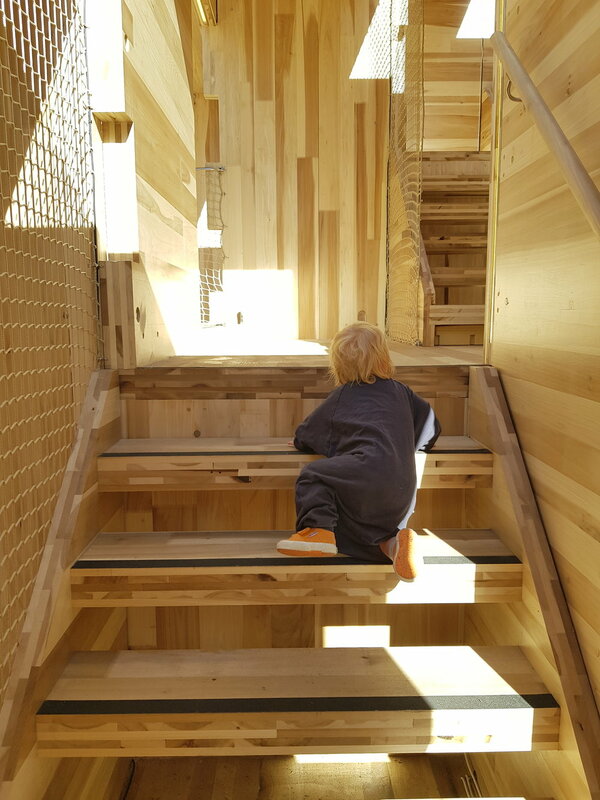 However a couple of other things struck us about it - 1) It made for an outstanding jungle gym for Clover, the daughter of Petalon founders Florence and James for the day. -2) We read on the information board that the panels the structure is made out of are a special type of plywood called CLT (Cross-laminated timber). This is basically mega-ply. It’s far thicker than the plywood most of us are used to and is made using a combination of high quality wood, lots of pressure and lots of glue. Because of the sustainable credentials of the American Tulipwood used in this case the makers claim these sheets lock in considerably more CO2 than they produce in their creation, making the structure a net positive when it comes to climate change. As we mentioned last week, we’ve been reliant on pedal power for most of the life of this company so far, and as such carbon neutrality hasn’t had to be a big concern of ours. Though we weren’t creating these kinds of emissions on our bicycles we were always big believers that neutrality isn’t the aim when it comes to a business’s footprint. Much of the damage has already been done, so if anything we need to be pushing hard in the other direction, hence our decision to donate £1 of every one of our bunches to bee charities. Our transition to nationwide delivery over this year has seen our relationship with carbon change, and we need to make sure to be continuing along this same proactive vein as we grow as a company. We’ve chosen to use a carbon neutral service from our delivery company, but our belief remains that neutrality is the bare minimum anyone should be aiming for, so we wanted to push this a bit further. We did some research and discovered that though it’s very difficult to quantify the CO2 created by any one of our deliveries, the answer seems to be somewhere between 50 and 200 grams. As a result we thought it best to go nuclear (probably a poor choice of word) in response and plant a tree in the UK, capturing about 1 tonne of CO2, for every 100 bouquets we deliver. That’s 10kg of carbon for every bunch we deliver. One consistent feeling during almost all of our experience with climate change issues as a company has been of confusion at the metrics involved and a resultant temptation to do nothing (a perfectly natural reaction to a massive problem that’s difficult to wrap your head around). We’ve found so far that the only thing that keeps our mind at ease is to go way overboard. By being sure that we’re at least covering ourselves as a business, but most likely acting as a net positive, it allows us to stop worrying about whether we are equal to our obligations and allows us spend our time focusing on offering the best service possible.